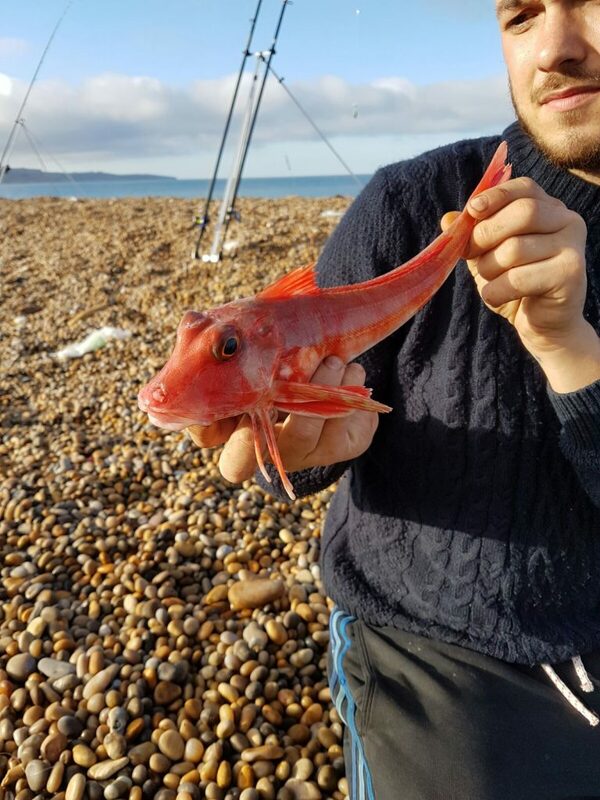 As the weather was looking considerably more settled than during the week it was decided that myself and a good friend and new to sea fishing Nick Snelling would hit the shingle of Chesil Beach, with the car loaded and spirits high we left full of optimism as to what this magical place would throw up for us today. Upon our arrival we were greeted to a surprisingly rather empty car park which is unusual for a Saturday evening but none the less a welcome surprise. 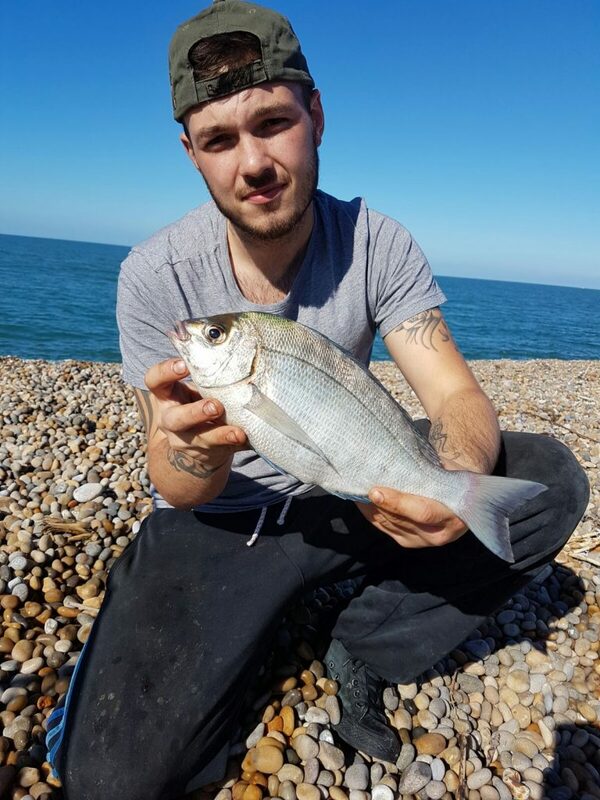 so we started the walk across the shingle and found there to be only a few anglers spread across the Ferrybridge section of the beach, we opted for out usual mark which is roughly within a few hundred yards the Adelaide wreck. With just a gentle breeze and a calming sea we set up base camp and got our lines in the water, my target for the night was to be a ray and Nicks was Smoothound. 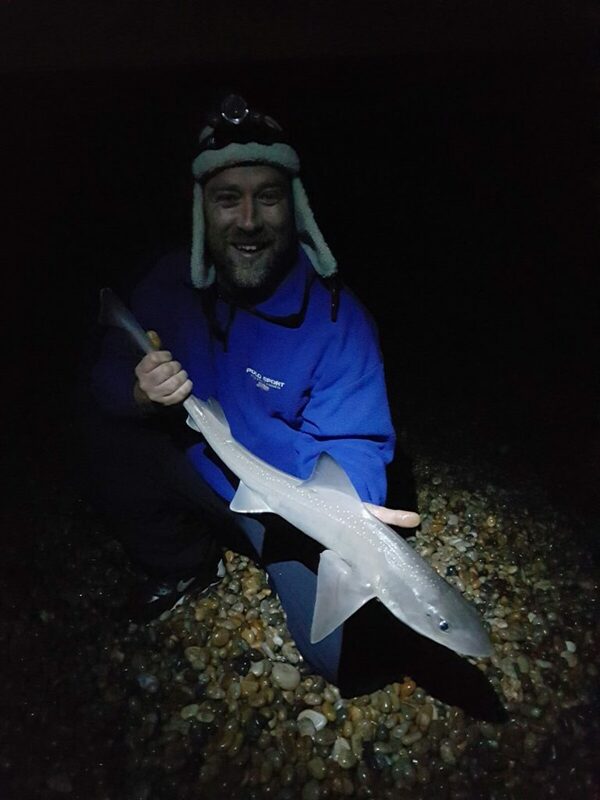 within 10 minutes of the first cast the rods were tapping away and before long the obligatory Pouting were on the beach, then a slightly better bite resulted in this 3lb 8oz Smoothound for Nick although just a pup he was over the moon because it was the first of this species for him. around an hour after that and 3 more pups for Nick out of nowhere my rod doubled over and i hit into something big, after a couple of initial thumps and slow lunges i was certain I was into a good ray, i managed to get it almost into the breakers when all of a sudden the line just went slack and the fish was gone… as gutted as i was i have to accept that that is fishing and these things do happen. All in all it was a pretty successful trip with a fair few fish and good company, after the yomp back to the car tired,aching and puffed out, and muttering the words ‘never again will i take this much gear’ and ‘i cant walk much further’ I already cant wait for my next session.